Thanksgiving is officially one week away and you know what that means: food. Lots of food! 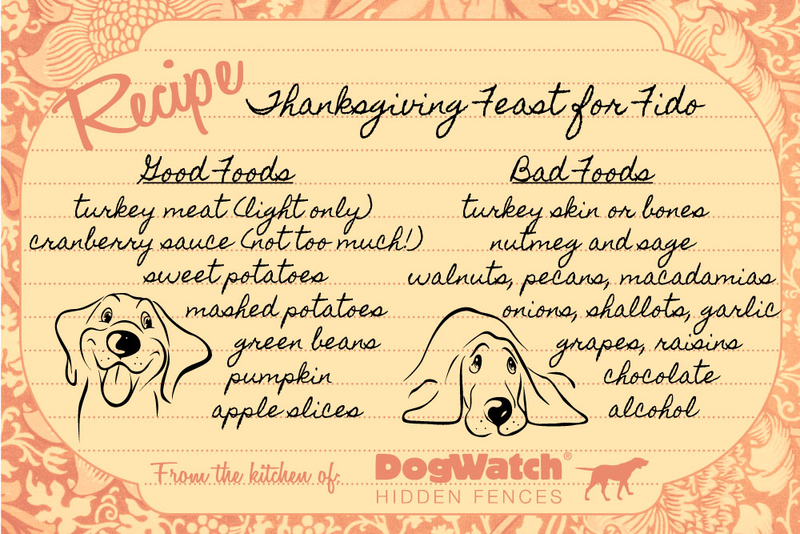 And, as much as we love all the turkey and fixings they are no bueno for something else we love: our pets. Thanksgiving also means lots of people and kitchen chaos, which means you may not pay attention to what your dogs eat or sneak on the side. But if you want a day without a pet emergency room visit, you might want to take note of the ASPCA’s do’s and don’ts of Thanksgiving for pet owners. Basically, the rules include no pets in the kitchen, stuff your turkey but not your pets, no booze hounds, and take out the trash! When talking turkey, it’s tough to not give your dog a little nibble of the bird but just make sure it’s fully cooked, skinless, boneless, and has no tracings of twine or foil. The skin can be especially dangerous for Fido, as it will have spices, sauces, and fats that are both dangerous and hard to digest. Bones, even those cooked like neck bones, are the worst and if ingested, will wreak havoc on a dog or cat’s digestive track. They splinter inside an animal and could lead to that dreaded emergency room visit. Lastly, be sure to double bag and wrap-tie the turkey carcass and toss in an outside bin. What’s the other Thanksgiving Day standard? Pumpkin pie! The pie is my absolute favorite but raw yeast dough will not be your pet’s fave. If ingested, the yeast converts sugars in the dough into carbon dioxide, gas, and alcohol, which can result in a bloated almost drunken pet with severe pain. This could be life-threatening and comes into play when making rolls and other bread items as well. Nutmeg is a key ingredient in pumpkin pie and yams, but it is a big no-no for dogs. In fact, the seasonal favorite can cause seizures and central nervous system problems if ingested by a pup. Pumpkin and sweet potatoes themselves are fine in moderation; just make sure they don’t have any nutmeg or other spices. Sage is also a popular Thanksgiving Day spice but it’s equally dangerous. It contains oils that upset a pooch’s tummy and should be avoided. Along those same lines are onions and garlic. These two are pretty commonly known as bad for dogs, but just in case you didn’t know it, keep them away from your four-legged friends at all costs. Both contain sulfides that are toxic to dogs and can lead to anemia. Between the two, onions are more toxic than garlic and cooking them does not reduce their toxicity. When I think of the holidays from my childhood, I remember my parents always had a big bowl of nuts on the coffee table. They were in a special wooden bowl and were not shelled. An old-school nutcracker and shell picker were always part of the set-up but when I think about it, it’s nuts to have nuts laying around if you have dogs, which we always did. Nuts, especially walnuts and macadamia nuts, are uber dangerous for your dog. If a bad reaction occurs, a dog will be unable to stand, will vomit, suffer tremors and an elevated heart rate, and will have both a fever and weakness within 12 hours of digesting the nuts. Thankfully most symptoms go away but why risk it? Keep those nuts up high people. If you think your precious pet may have ingested a potentially poisonous substance, call the ASPCA Animal Poison Control Center at 888-426-4436. It’s a number you should probably keep handy all year long. 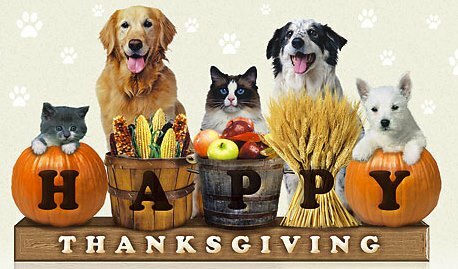 Have a Happy Thanksgiving and one with safe and happy pets! I cared for a friend’s dog once and fed him turkey thinking I would treat him. Yikes, was he ever sick! I don’t think I had my friend anymore.